That relationship is still evolving. Nationalists and unionists in the north are engaged in a unique power sharing and partnership mode of governance - and all-Ireland political structures are established and beginning to work well. For all these reasons Sinn Fein set out our concerns about the visit of the English Queen at this time. I have also expressed my hope that some good will come from it. The political reality in Britain of course is that the legal and constitutional powers of the Queen rest with the British Prime Minister of the day. It is David Cameron who personally exercises all of the Crown Prerogatives and does so without recourse to the British Parliament. This includes approving Queen Elizabeth’s speeches. As we have said many times, Sinn Fein wants to see a real, new and profoundly better relationship between the peoples of Ireland and Britain, one built on equality and respect. It will require ongoing work and a committed focus in the time ahead, particularly by the Irish Government.Building healthy, friendly ‘normalised’ relations with our nearest neighbour is in everyone’s interest. The peace process creates a democratic, inclusive way to do this. All of us have come some way - the process has delivered. This week’s events are evidence of that but there is still a journey to be completed.As the President remarked ‘this may still be a work in progress’ as well as ‘a work of progress, of partnership and friendship’ ... ‘an important sign - among a growing number of signs’ of the fresh start envisaged in the Good Friday Agreement. 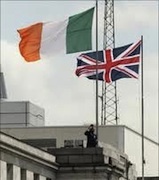 The challenge is to ensure that this is built upon and that reconciliation gestures, though important in themselves, do not become substitutes for real political action and positive change.In practice that means there is an outstanding need for the Irish and British governments to honour their obligations and guarantee full implementation of all the terms of both the Good Friday and St Andrews Agreements. The Irish Government and the British Government have spoken a lot in recent days about new beginnings and that is welcome. However, the British Government has thus far steadfastly refused to release files on the Dublin and Monaghan bombings, and on other attacks which have involved their agents in this state. Mr Cameron needs to act on this issue on the terms outlined by the families of victims of these attacks. Sinn Fein is working with our unionist partners in the North and every day we are seeking to explore possibilities for the future based upon equality, respect and tolerance. Like all democrats we seek an end to partition and the reunification of our people and our island. So the visit by the Queen of England to this part of Ireland has to be seen as part of a journey. It is a page in a book - not the end of that book.